First off, I would like to thank Mike Melton and Basketball Spotlight staff for allowing me to share my experiences with the world. I would also like to thank God for the gift of basketball and my parents who continue to support me. This will be my last entry because basketball is over for me this summer. The rest of my summer consists of getting stronger, better, and faster while preparing for this upcoming high school season. This past week was packed with basketball! It was the best week of the summer! 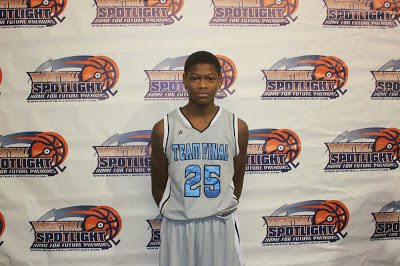 I went to Hoop Group Future All American Camp and played with some of the best talent around. Then I had the opportunity to go to Syracuse Elite Camp before I headed down to North Carolina for CP3 camp. I gave my all at each of the camps. I played well at CP3 and made the Dunk Dog All American game. It was a really good experience and a lot of fun. I played alongside Nazi Reid, Atiba Taylor, Damon Harge, Robert Woodard and more. Yeah, we were having fun, but as soon as we got in the game, everything changed; it got really competitive. My team ended up winning by two. This has been an incredible summer of basketball, and I am looking forward to getting better and starting high school. Once again, I would like to thank Mike Melton for selecting me to do the Diary of a Baller. It has been great sharing my life with you! See you at the JEM All Star Classic this weekend!